My full report on the very enjoyable 2011 vintage in Burgundy will be published in January 2013, once I have tasted another 1000+ plus samples in London, but these are my initial thoughts, based on eight days of extensive tasting and research in the region, including visits to 35 top producers, including DRC, Roumier, De Vogüé, Lafon, Leflaive, Cathiard and Liger-Belair. 1. 2011 is a good to very good Burgundy vintage, both for reds and whites. It is not as exceptional as 2009 or 2010 – indeed, it is a little unfortunate to follow two such wonderful, if contrasting harvests – but it still ranks among the best of the last decade, behind 2005, 2009 and 2010, but ahead of 2001, 2002, 2003, 2004, 2006, 2007 and 2008, in my opinion. 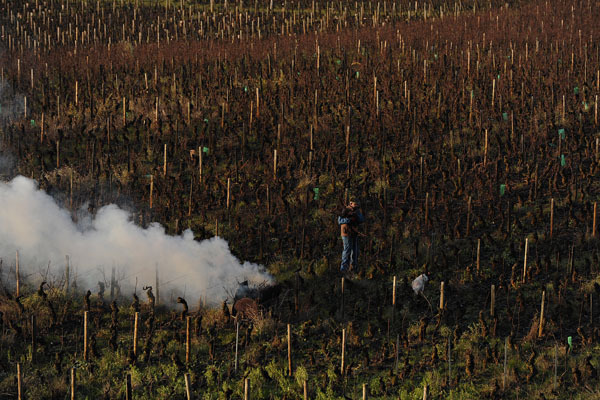 A number of growers – Yves Confuron and Jean-Marc Roulot among them – prefer their 2011s to their 2010s. And almost everyone in Burgundy calls it a “nice surprise”, producing red wines that developed extra structure in barrel. 2. This was one of the earliest vintages on record, with many growers picking at a time when they should have been on a beach. This was only the sixth occasion since records began that the harvest kicked off in August, the other five being in 1710, 1822, 1893, 2003 and 2007. Who says that global warming is an invention? 3. Or maybe that should be climate change. As they were in Bordeaux, the seasons appeared to come in the wrong order in 2011, with “summer” in spring and a cool, wet “spring” in summer. In fact, the vintage could have been even earlier if it hadn’t been for the cool July and first two weeks of August, so mild was the spring. The unusually warm spring weather meant that grape skins were relatively thick, which proved to be a godsend when disease pressure mounted in July and early August and has also given the reds fairly deep colours. Rot was generally less prevalent than in 2010, although I have noted it in a number of samples from Chablis. The percentage of rotten and oidium- and mildew-affected berries removed varied between almost none and 20%, depending on the age and situation of the vineyard, but this was still a year when sorting tables were in evidence. The last two weeks of August, when the rain finally stopped after a month, saved the vintage, according to Jean-Marie Fourrier of Domaine Fourrier. 4. The hallmark of the 2011 wines is charm and easy-going fruit, made (in most cases) from early-picked fruit yielding ripe, but not over-ripe flavours. The fact that malolactic fermentations were often completed before the winter has contributed to their softness and approachability. These are wines to drink and enjoy comparatively young in most cases, with supple tannins and medium concentration. So much so, that the best of them are delicious in barrel. They may not have the weight and power of the 2009s or the finesse, energy and balance of the 2010s, but they are somewhere between the two in style, with a little bit of 2007 thrown in. Older winemakers mentioned 1981 as a point of comparison, but added that the vintage was wetter thirty years ago. Burgundians are also much better at dealing with tricky harvests than they were then. 5. The wines are generally low in alcohol, which might come as a relief after 2009. As a result, most people chaptalised by between 0.1 and 1%, although this was as much to prolong alcoholic fermentation as to increase alcohol levels. More than one producer told me that 2011 is a return to an old-fashioned Burgundian vintage, albeit one defined by August, rather than mid or late September picking. 6. If you include 2012, of which more in a moment, the Burgundians have had three small crops in a row. Taking 2010, 2011 and 2012 as a trio, the region has lost the equivalent of an entire harvest in the space of three years. No wonder Burgundians are praying that 2013 will be a bumper 2009-style vintage. 7. Given the modest size of the crop– and the miniscule amounts of 2012 sitting in barrel at some domaines, especially in the hail-struck Côte de Beaune – prices are set to rise by 5 to 10% in general, although this will be offset by the sterling/euro exchange rate, which is healthier than it was a year ago. Some growers may attempt to recoup some of their losses from 2012 by pushing up the prices of their 2011s, although others, such as Domaine Dujac, are going to reduce them because “2011 is a notch down from 2010 and 2009”, according to Jeremy Seysses. 8. If so, it’s hard to see the fine wine world refusing to pay them, given the global clamour for top Burgundy. As an indication of this, hammer prices at the annual Hospices de Beaune auction in November this year rose by 69% for the reds and 18% for the whites across the 512 lots. The law of supply and demand has rarely been so apparent. 9. Not all Burgundian sub-regions were equally affected. Crops were more generous in Chablis and the Mâconnais, for example. As ever in Burgundy, but even more so in a year of meagre volumes, your best bet if you’re on a tighter budget is to look to “lesser” appellations, such as Monthélie, Chorey-lès-Beaune, Beaune, Saint Romain, Marsannay, Givry and the Mâconnais. There are also some very enjoyable generic wines in 2011: light, fruity and very quaffable. 10. As ever in Burgundy, but even more so in trickier vintages, this is a year when the best growers and négociants have coped best with the challenges of the harvest. It is a vintage where the wines reflect their terroirs when they are well made. In short, they are wines to buy and savour. And remember: there won’t be much 2012 to go round. To download my report on the 2010s for £10, click here.